3. Go to the website: 192.168.49.1, Lollipop Home---WiFi AP---Scan---Scan Result---Choose your home wifi name and enter password---Connect. 4. Once set up, your iPhone can mirror to big screen and use Wi-Fi to surf the Internet. 5G WiFi: compatible with the 802.11ac standard, 5GHz WiFi delivering speeds is almost three times as fast as 802.11n. play videos on your phone, then the video is also mirrored on the large screen. Click full video screen on your phone. The wireless display adapter is not compatible with Netflix and Plex on IOS system. Connect the product wifi -- Go to webside: 192.168.49.1 -- Settings -- choose 2.4G or 5G -- submit. 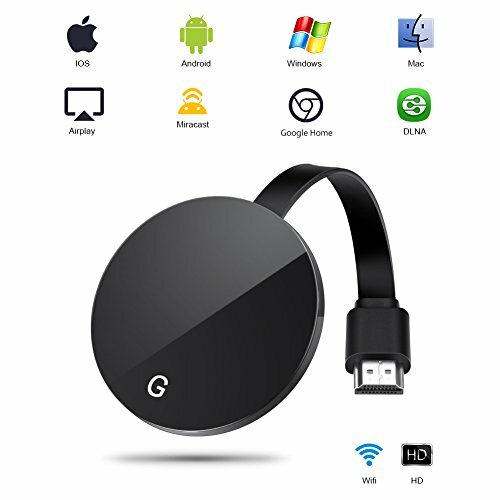 ◕‿◕ POWERFUL COMPATIBILITY: Supports Google Home, Miracast / DLNA / Airplay protocols. Compatible with Hulu, Netflix,Honda and encrypted video(Only for Android Phone). iPhone can cast YouTube and unencrypted videos. If you have any questions about this product by StarPlayer, contact us by completing and submitting the form below. If you are looking for a specif part number, please include it with your message.